Each year, thousands of meth labs are sold to unsuspecting buyers who have no idea that the home's surfaces, insulation and carpeting may be steeped in poisonous substances. If the house you're looking to buy is a former meth lab, the seller may not have to tell you about it. Each year, thousands of meth labs are discovered by police, while thousands more go undetected. Many of these labs are in houses that eventually get sold to unsuspecting buyers who have no idea that the home's surfaces, insulation and carpeting may be steeped in poisonous substances. See which counties have the largest number of contaminated sites. Unlike lead paint, there are no federal rules that require sellers or their agents to disclose a home's meth history. Instead, disclosure regulations are made by the individual states and can vary dramatically. Even in strict states like Missouri, where meth labs number in the tens of thousands, sellers aren't required to determine whether a home is contaminated before selling it, said Timothy Sigmund, chair of the property law committee of the Missouri Bar Association. Sellers may also be allowed to conceal a home's meth lab past if the house has gone through decontamination. In Arkansas, for example, an owner has no duty to disclose once the property is deemed in compliance with safety standards by the state's Department of Environmental Quality. However, in some hard-hit areas, decontamination can be a selling point. Real estate agents are expected to abide by an industry code of ethics, which requires them to reveal all known material factors, according to National Association of Realtors' spokesman Walter Molony. The key word there is "known," however. 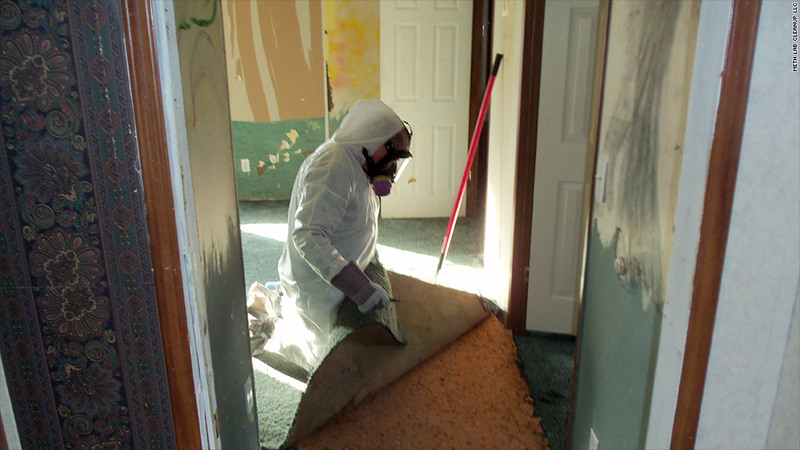 Agents can't be held responsible if the home is later found to be contaminated. To minimize the odds of buying a former meth lab, first check the DEA's National Clandestine Laboratory Register. Clicking on your state will reveal a list of known contaminated properties and addresses. Buyers should also check out the property's deed at the county clerk's office, said Ted Goodman, an attorney with Murfree & Murfree in Murfreesboro, Tenn. In some states, when meth labs have been uncovered by local law officers, the property must be registered with the clerk. When inspecting a house, look for telltale signs of meth production, said Mazzuca. If there are old cans, bottles or packages of substances like acetone, muriatic acid, brake cleaner, drain cleaner, iodine, paint thinner, phosphorus or ether lying around, that's a big red flag. So are rubber gloves or tubing, dust masks, propane tanks, coolers and camp stoves. Beware of cheap foreclosed properties, which are usually sold "as is." Many meth users have messy lives. They lose their homes to foreclosure and the properties are often trashed and abandoned. Some are quickly resold at rock-bottom prices. Once it's been determined that a house is contaminated, the cost of cleaning it up usually falls to the current owner, according to Sigmund. That can run $10,000 or more. Sigmund says he knows of no case where the buyer successfully sued a prior owner to recover the money. And there's little chance of collecting anything anyway. The former owners are typically meth users themselves and the small labs they built are often to feed their own habits. "Meth heads are typically low-lifes, disgusting, filthy people," said Mazzuca. "There's not a lot of money involved."